The Heligoland–Zanzibar Treaty (German: Helgoland-Sansibar-Vertrag; also known as the Anglo-German Agreement of 1890) was an agreement signed on 1 July 1890 between the German Empire and the United Kingdom. Under terms of this treaty, Germany gained the small but strategic Heligoland archipelago, which its new navy needed to control the new Kiel Canal and the approaches to Germany's North Sea ports. In exchange, Germany gave up its rights in the Zanzibar region in Africa, allowing Zanzibar to provide a key link in the British control of East Africa. Germany gained the islands of Heligoland (German: Helgoland) in the North Sea, originally part of Danish Holstein-Gottorp but since 1814 a British possession, the so-called Caprivi Strip in what is now Namibia, and a free hand to control and acquire the coast of Dar es Salaam that would form the core of German East Africa (later Tanganyika, now the mainland component of Tanzania). In exchange, Germany handed over to Britain the protectorate over the small sultanate of Wituland (Deutsch-Witu, on the Kenyan coast) and parts of East Africa vital for the British to build a railway to Lake Victoria, and pledged not to interfere with British actions vis-à-vis the independent Sultanate of Zanzibar (i.e. the islands of Unguja and Pemba). In addition, the treaty established the German sphere of interest in German South West Africa (most of present-day Namibia) and settled the borders between German Togoland and the British Gold Coast (now Ghana), as well as between German Kamerun and British Nigeria. Britain divested itself of a naval base which covered the approaches to the main German naval bases in the North Sea, but which would be impossible to defend as Germany built up its navy. It immediately declared a protectorate over Zanzibar and, in the subsequent 1896 Anglo-Zanzibar War, gained full control of the sultanate. The treaty served German chancellor Leo von Caprivi's aims for settlement with the British. After the 1884 Berlin Conference, Germany had already lost the "Scramble for Africa": the German East Africa Company under Carl Peters had acquired a strip of land on the Tanganyikan coast (leading to the 1888 Abushiri Revolt), but had never had any control over the islands of the Zanzibar sultanate; the Germans gave away no vital interest. 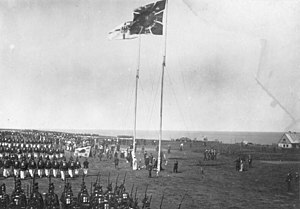 In return, they acquired Heligoland, strategically placed for control over the German Bight, which, with the construction of the Kiel Canal from 1887 onward, had become essential to Emperor Wilhelm's II plans for expansion of the Imperial Navy. Wilhelm's naval policies aborted an accommodation with the British and ultimately led to a rapprochement between Britain and France, sealed with the Entente cordiale in 1904. The misleading name for the treaty was introduced by ex-Chancellor Otto von Bismarck, who intended to attack his despised successor Caprivi for concluding an agreement that Bismarck himself had arranged during his incumbency. However, Bismarck's nomenclature implied that Germany had swapped an African empire for tiny Heligoland ("trousers for a button"). This was eagerly adopted by imperialists, who complained about "treason" against German interests. Carl Peters and Alfred Hugenberg appealed for the foundation of the Alldeutscher Verband ("Pan-German League") which took place in 1891. ^ James Stuart Olson; Robert Shadle (1991). Historical Dictionary of European Imperialism. Greenwood. pp. 279–80. ^ David R. Gillard, "Salisbury's African Policy and the Heligoland Offer of 1890." English Historical Review (1960): 631-653. ^ Perras, Arne (2004). Carl Peters and German Imperialism 1856–1918: A Political Biography. Clarendon Press. pp. 168–79. Perras, Arne (2004). Carl Peters and German Imperialism 1856–1918: A Political Biography. Clarendon Press. pp. 168–79.